Foreign bodies, Esophageal perforation, Endoscopic, Treatment, Titanium clip, Transparent cap. OTSC: Over-The-Scope Clip; CT: Computed Tomography. Patients ingesting foreign bodies are commonly seen in hospital. Clinical trials show that swallowing of foreign bodies is frequently seen in children, especially those aged between 6 months and 6 y . However, foreign body ingestion in adults is often related to eating a bolus of bone or meat . Most of the intentionally ingested foreign bodies pass through the alimentary canal without any problem. Endoscopic intervention resolves approximately 10% to 20% of foreign bodies, which are lodged in the gut. However, less than 1% of foreign bodies develop complications such as perforation or penetration of the digestive tract [3-5]. Perforation of esophagus, inability to swallow, dysphagia and retrosternal pain are common clinical features . Esophageal wall penetration is a life threatening condition as the foreign bodies trigger mediastinal vascular complications . We report a case of intentional ingestion of chicken bone and penetration of its two tips into the esophageal wall. A 84 y old female reported to our outpatient clinic with retrosternal pain following accidental ingestion of a chicken bone 3 d ago. When the retrosternal pain turned severe with “something stuck in her throat”, followed by serious dysphagia and nausea, she was admitted to our hospital for treatment. No vomitus, melena, hematemesis, hemoptysis, or dyspnea occurred. Her vital signs were stable with a body temperature of 36.5°C, pulse rate 76 beats/min, respiratory rate 18 beats per min, and blood pressure 130/80 mmHg. Physical examination was essentially normal (with no subcutaneous crepitations) and laboratory tests were unremarkable. The patient had a 10 y history of hypertension and was routinely treated with oral metoprolol. Her current blood pressure is stable. Emergent gastroscopy revealed a bone in the esophageal entrance bilaterally (Figure 1A). We changed the orientation of the bone from horizontal to vertical axis using a transparent cap. The bone was caught by foreign-body forceps and removed endoscopically (Figure 1B). Postoperative purulent secretion was clearly seen in the perforation edges. In view of the patient’s clinical condition and size of the defect, an endoscopic intervention was decided. A titanium clip was used. The clip was made of titanium alloy wire. It was simple, userfriendly and reliable. The perforation size was endoscopically measured with a biopsy forceps. The defect was closed using two clips (Figure 1C). The whole procedure lasted approximately 20 mins. Next day, we performed a Computed Tomography (CT) scan of the chest to evaluate any complications following endoscopy (Figure 2). Figure 1: Endoscopic performance and intervention. A: Chicken bone penetrating the esophageal wall bilaterally; B: Endoscopic removal of the bone without any complications; C: Clipped perforation (using titanium clip). 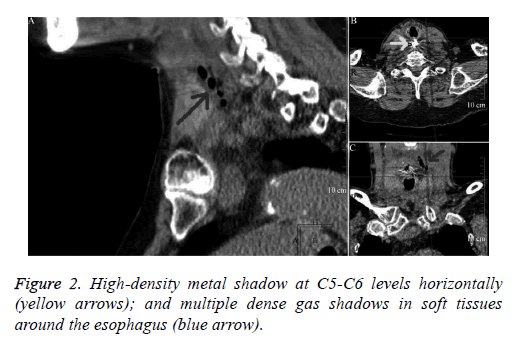 Figure 2: High-density metal shadow at C5-C6 levels horizontally (yellow arrows); and multiple dense gas shadows in soft tissues around the esophagus (blue arrow). This patient received intravenous antibiotics, proton pump inhibitors and parenteral nutrition over the next 10 d and was discharged without retrosternal pain, dysphagia, acid reflux or heartburn. Post-operative follow-up lasted for 3 months and the patient leads a normal life currently. This study was conducted in accordance with the declaration of Helsinki. This study was conducted with approval from the Ethics Committee of Ningxia Hui Autonomous Region People’s Hospital. Written informed consent was obtained from participant. Perforations due to foreign bodies are rare, but lethal. Some research has shown that conservative treatment will prolong the hospital stay, increase costs and mortality rate . Nowadays, more and more publications have recommended endoscopic intervention for gastrointestinal disruptions by different foreign bodies. In view of the age and our patient’s coexisting diseases, we determined using the endoscopic therapy for her disease. We know that the self-expanding stents can be used to treat alimentary canal perforation and it can even treat the grade IV perforations . It appears to be a promising treatment for gastrointestinal tract disruptions. But the stents treating have some deficiencies: they can’t be used in gastric canal and the stents dislocation is an usual problem . Boeckel et al. reported the failure rate of stents is nearly 15% . On the other hand, the tissue in- and overgrowth through the stent impedes the removal of it. So the treatment using stents may need further verified. Meanwhile, Over-The- Scope Clip (OTSC) is a standard approach to treat alimentary tract perforation. The OTSC system provides a secure and successful closure of esophageal perforation. The postoperative complications are rare and the long-term clinical outcomes are excellent . Due to lack of access to OTSCs and cost-benefit analysis, we selected an alternate method based on titanium clips and endoscopy. And our patient did not manifest any complications, such as esophageal stenosis or clinical dysphagia. In our case, the results with titanium clip were encouraging. But we were lucky that the infection around the perforation not severity. Because of applying the clip around the inflamed or indurated tissue can be difficult and may even worsen the situation. So the closure should be delayed in case of mucosal edema . Under these circumstances, the Endo- SPONGE (Endoscopic vacuum assisted closure) may be a good choice. Endo-SPONGE has an open-pored polyurethane sponge and a suction tube which connecting to a wound drainage system. It allows a gentle, continuous suction over all tissues contacting with the sponge surface . However, any sharp margins of the foreign bodies require careful endoscopic intervention to avoid the risk of injury. Therefore, a transparent cap to protect the surrounding tissues may be desirable. The mean recovery time after successful clipping of an esophageal perforation was 18 d . Chronic perforation (>10 d) was the only independent factor predicting perforation closure . Therefore, diagnosis of foreign body ingurgitation must specify the need for emergency intervention, especially in patients with perceived risk of aspiration and perforation . Presence of sharps, batteries, and food impactions causing obstruction or other complications warrant prompt intervention . On the other hand, we allows the spontaneous passage through the alimentary canal without evidence of complications.16 Nevertheless, we should ensure that foreign objects or food bolus does not remain in the esophagus beyond 24 h after diagnosis . Here is a question, when some cases of batteries ingestion, especially for those batteries that lodge in the esophagus, the serious complications may occur and even to death. A clinical trial reveals that the esophageal corrosive injury and burn can occur as early as 2.5 h after deglutition, meanwhile the esophageal perforation can occur within five hours . So we need to take immediately removal of it within 2 h because the severe esophageal damage may occur during a short time. Titanium clips are an inexpensive, safe and tolerable method for patients with perforation. The advantages include simplicity, avoidance of surgery and reduced length of stay. We demonstrated that this method can be used to treat small esophageal perforations caused by foreign bodies within 5 d of injury. This work was supported in part by the National Natural Science Foundation of China (81360323). Webb WA. Management of foreign bodies of the upper gastrointestinal tract: update. Gastrointest Endosc 1995; 41: 39-51. Roura J, Morello A, Comas J, Ferran F, Colome M, Traserra J. Esophageal foreign bodies in adults. ORL J Otorhinolaryngol Relat Spec 1990; 52: 51-56. McCanse DE, Kurchin A, Hinshaw JR. Gastrointestinal foreign bodies. Am J Surg 1981; 142: 335-337. Maleki M, Evans WE. Foreign-body perforation of the intestinal tract. Report of 12 cases and review of the literature. Arch Surg 1970; 101: 475-477. ASGE Standards of Practice Committee, Ikenberry SO, Jue TL, Anderson MA, Appalaneni V, Banerjee S, Ben-Menachem T, Decker GA, Fanelli RD, Fisher LR, Fukami N, Harrison ME, Jain R, Khan KM, Krinsky ML, Maple JT, Sharaf R, Strohmeyer L, Dominitz JA. Management of ingested foreign bodies and food impactions. Gastrointest Endosc 2011; 73: 1085-1091. Tammana VS, Valluru N, Sanderson A. All the wrong places: an unusual case of foreign body ingestion and inhalation. Case Rep Gastroenterol 2012; 6: 778-783. Benmansour N, Ouattassi N, Benmlih A, Elalami MN. Vertebral artery dissection due to an esophageal foreign body migration: a case report. Pan Afr Med J 2014; 17: 96. Karl RC, Schreiber R, Boulware D, Baker S, Coppola D. Factors affecting morbidity, mortality, and survival in patients undergoing Ivor Lewis esophagogastrectomy. Ann Surg 2000; 231: 635-643. Tuebergen D, Rijcken E, Mennigen R, Hopkins AM, Senninger N, Bruewer M. Treatment of thoracic esophageal anastomotic leaks and esophageal perforations with endoluminal stents: efficacy and current limitations. J Gastrointest Surg 2008; 12: 1168-1176. Feith M, Gillen S, Schuster T, Theisen J, Friess H, Gertler R. Healing occurs in most patients that receive endoscopic stents for anastomotic leakage; dislocation remains a problem. Clin Gastroenterol Hepatol 2011; 9: 202-210.
van Boeckel PG, Sijbring A, Vleggaar FP, Siersema PD. Systematic review: temporary stent placement for benign rupture or anastomotic leak of the oesophagus. Aliment Pharmacol Ther 2011; 33: 1292-1301. Zhan X, Wang B, Di D, Zhuang Y, Zhang X, Chen J. Endoscopic closure of gastric tube perforations with titanium clips: a four-case report. World J Surg Oncol 2015; 13: 25. Rogalski P, Daniluk J, Baniukiewicz A, Wroblewski E, Dabrowski A. Endoscopic management of gastrointestinal perforations, leaks and fistulas. World J Gastroenterol 2015; 21: 10542-10552. Qadeer MA, Dumot JA, Vargo JJ, Lopez AR, Rice TW. Endoscopic clips for closing esophageal perforations:case report and pooled analysis. Gastrointest Endosc 2007; 66: 605-611. Sugawa C, Ono H, Taleb M, Lucas CE. Endoscopic management of foreign bodies in the upper gastrointestinal tract: A review. World J Gastrointest Endosc 2014; 6: 475-481. Loh KS, Tan LK, Smith JD, Yeoh KH, Dong F. Complications of foreign bodies in the esophagus. Otolaryngol Head Neck Surg 2000; 123: 613-616. Srivastava G. Foreign bodies in the oropharynx, gastointestinal tract, ear, and nose. Clin Pediatr Emerg Med 2010; 11: 81-94.